The competition hosts will take on four-time regional champions New Zealand in the final after the Kiwis squeezed past New Caledonia 1-0 in the first semi-final of the day. Papua New Guinea coach Flemming Serritslev was deservedly elated at his side’s performance. “It’s a fantastic day for PNG football and for the country. I’m so proud of those boys for how hard they’ve worked since the beginning of April,” Serritslev says. It was a thrilling 90 minutes for the home side in front of one of the largest crowds for the tournament to date, with fans not deterred by the political events which had taken place earlier in the day. In their group matches Papua New Guinea took the lead twice but allowed their opponents to pull back in line and tonight seemed like that could be the case once again. A 38th minute strike from Michael Foster, who received a well-timed pass from Raymond Gunemba before rounding keeper Phillip Mango, gave the Kapuls the lead they were after. However they soon allowed the Solomon Islands to pull themselves back into finals contention when Judd Molea put the ball past Ronald Warisan directly from the corner. The tension increased after the break as both sides continued to search for a winner, with quick counter attacks taking play from end-to-end. Solomon Islands goalkeeper Phillip Mango had a blinder denying the impressive and relentless strike force of Gunemba, Foster, Nigel Dabingyaba and Tommy Semmy time and again. However despite Mango’s being in-form as ever, he couldn’t hold Papua New Guinea off forever and as the clock headed into the final ten minutes of the match Dabingyaba pounced on a loose ball to give his side the lead for a second time. This time the home side held tight to that one-goal advantage to see themselves through to a final against New Zealand on Saturday. 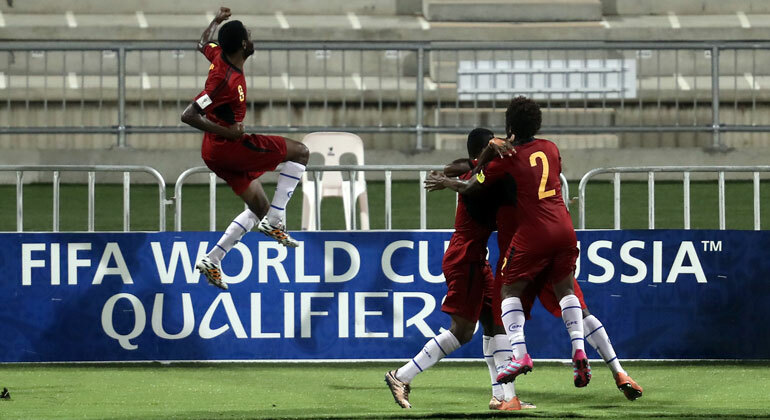 The win was a dream come true for Papua New Guinea captain David Muta. “I’m so excited. It was my first time leading the boys from PNG in a semi-final and I’m just so happy and so pleased with how well they all performed,” Muta says. “A big thanks to all our supporters who have been behind us since day one. Having been in a similar position four years ago Henry Fa’arodo was hoping results might be different this time around, however accepts that his side didn’t quite have the edge to get past an organised PNG side. “It’s very disappointing for us, we were looking forward to this game today and I think we deserve a little more out of the game today – it could have gone either way,” he says. The day’s opening semi-final was a repeat from the 2012 edition of the tournament in Honiara between New Zealand and New Caledonia. It was a close match, which All Whites coach Anthony Hudson admitted at the final whistle. Les Cagous came out firing on all cylinders and not only did they dominate possession 60-40, they also gave goalkeeper Stefan Marinovic a fairly decent workout. Cesar Zeoula appeared to have shaken any remaining jetlag from his journey back to the Pacific from France where he plays Ligue 2, and along with Roy Kayara pressed forward to create havoc for New Zealand’s backline to deal with. Up front for the Caledonians Jean-Philippe Saiko was also hitting his best form of the tournament with some incredible solo runs leaving a number of All Whites scrambling to provide defensive cover. The break the Kiwis were after came shortly after the restart as a Chris Wood free kick was misjudged by Jelen Ixolee who tipped it over his own head and into the back of the net. Possession remained in New Caledonia’s favour in the second half and the number of shots they had increased however Marinovic covered his area well to keep some stunning strikes at bay. New Zealand captain Chris Wood was pleased to get on the board, but his main focus was getting the win and progressing in the competition. “Of course it’s always nice to score but the main thing is we’re through to the next stage,” Wood says. It was a disappointing end to the tournament for New Caledonia’s veteran captain Bertrand Kai, especially following such an outstanding performance from his team. “It was a great performance from us, we knocked on New Zealand’s door with the way we played tonight,” he says. New Zealand will play Papua New Guinea in the final of the 2016 OFC Nations Cup at Sir John Guise Stadium in Port Moresby on Saturday 11 June at 4pm.